One requirement for American citizenship is to pass an oral American citizenship test. A government officer will ask up to 10 questions from a list of 100 questions to study. To pass you must answer 6 questions correctly. 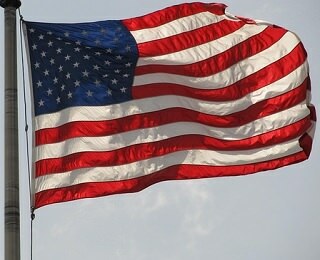 The American flag has 13 red and white stripes for the 13 original states. The 50 stars represent the 50 states we have now. It’s important to study all 100 questions and answers. (You can find them here-- see the links for a downloadable pdf.) Often questions have more than one possible answer. You only need to give one—or as many as the question requests. Be sure to look up the current names of any government officials it asks for—the current president, your state senators or governor, etc. So how can you remember all 100 questions and answers on the American citizenship test? The best way is by understanding WHY American government is designed the way it is. If you know the stories of the Founding Fathers—their hopes and fears and earlier experiences with government—you can remember the way they solved the problems of government. If you know a little about American history, you won’t have to memorize a list—you’ll remember what happened! In the next sections on this page are a few of the stories that explain American government—and links to more. The Constitution is the supreme law of the land—over any other law. It sets up (or defines) the government and protects our basic rights. An amendment is a change or addition to the Constitution. One of the reasons our constitution still works (after almost 230 years of major change) is that it can be amended. Americans can amend the Constitution whenever the people in enough states think it needs to be changed. In fact, the Constitution would probably never have been accepted without a promise of the first ten amendments. Those first ten amendments are called the Bill of Rights. They guarantee rights that many people had feared they might lose under the Constitution’s stronger government. The first amendment guaranteed that the government could not take away people’s freedom of speech or religion, their right to assemble (meet in groups) peaceably, and to petition the government (ask the government to make changes.) It also guaranteed a free press that the government could not control or censor. At that time the press meant newspaper or book publishers. It now also includes other news media like radio or TV. There are now 27 amendments, including ones guaranteeing the right to vote to people of all races and to women. The Constitution set up the American system of government, based on checks and balances between the three branches so no person or group could become too powerful. The legislative branch (Congress) makes the laws. The executive branch, led by the President, enforces the laws and runs the government. The judicial branch (the courts) reviews and explains the laws and can overturn any laws that violate the Constitution. The government was designed so that each branch could “check” (stop) any other branch from trying to take too much control. Congress makes the laws but the President signs them—or can veto them if he thinks they are harmful. However, he cannot stop a law that almost everyone wants, because Congress can override his veto if 2/3 of both houses agree. (To “override” a veto is to pass the law in spite of it.) Congress may also impeach a president and remove him from office in extreme cases. The President appoints (chooses) his Cabinet: the Secretary of State for foreign affairs, the Secretary of Defense, the Secretaries of Labor, Education, Commerce, Agriculture, etc. They run the departments of the government. He is the Commander in Chief of the U.S. military. He also appoints federal judges, including the Supreme Court, but Congress must approve the appointments before they take effect. Once Supreme Court justices are appointed, they can decide that any law of Congress or any action of the President is unconstitutional and overturn it. Their decision is final (since the Constitution is the supreme law of the land.) The only way to change it is to pass an amendment to the Constitution, or to wait until different Supreme Court justices may decide to look at it again. In addition to the separation of powers between the branches, Congress is divided into two parts (“houses”) that can check each other to protect the people and the states. The plan for two houses was a compromise between the large states (which thought they should have more votes because of their bigger populations) and the small states who wanted to protect their rights. In the House of Representatives each state gets a number of Representatives based on its population, for a total of 435 members. Representatives run for election every two years, so they must be sensitive to what the people in their districts want. In the Senate each state can elect two Senators, for a total of 100 Senators. They are elected by their whole state for six years at a time. Both Houses must agree to pass legislation. It also has excellent audio and written articles on George Washington and James Madison. Washington earned the title “the Father of his Country.” He led the Continental Army that won independence from Great Britain. Then he presided over the Constitutional Convention. He encouraged the delegates make the compromises needed to establish a strong national government. Finally, he was elected the first president of the United States, and, as the article says, in many ways “invented” the presidency. Madison spent months before the Constitutional Convention studying different governments in history. He persuaded the other delegates of the need for a strong national government. He also helped work out some of the compromises that made the Constitution possible. Then he helped write the Federalist Papers (along with Alexander Hamilton and John Jay), to convince the states that they should ratify (accept) the Constitution. They explained how the Constitution would make a more effective government. They also argued that its separation of powers would help preserve liberty and prevent abuses of power. American citizenship involves both rights and responsibilities. Only citizens over age 18 have the right to vote or hold federal office. Voting is also a responsibility of citizens. So is serving on a jury. Some rights guaranteed in the Bill of Rights are for everyone living in the U.S., whether they are citizens or not. These include freedom of speech, of worship, of assembly, and the right to bear arms. When someone becomes a citizen, they promise to be loyal to the U.S. and not to any other country and to obey American laws. 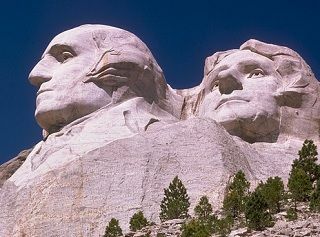 Try the matching quiz below to see how much you know about the famous Americans mentioned in the American citizenship test history questions. Then try an American government crossword (pdf). Check your answers here. Match these famous Americans with their descriptions. (The first one has been done as an example.) If you prefer to work offline, you can download this exercise and its answers as a pdf by right-clicking here. for a discussion of the vocabulary of agreement and opposition and an explanation of American politics. You can read some famous presidential speeches, and practice vocabulary connected with foreign policy, at Practice Academic Vocabulary (parts of J.F. Kennedy’s first State of the Union Address), U.S. Presidents on Berlin, and Obama on Polish Freedom. Practice Citizenship and Immigration Vocabulary includes a video and transcript of another speech by President Obama (at a naturalization ceremony for new citizens) as well as a vocabulary matching exercise. Home> English Language Test Preparation> American Citizenship Test Questions.